Brett Gadsden is Associate Professor of History at Northwestern University. He specializes in 20th century American and African American history, with a specific focus on black political and social history, black freedom struggles, and racial discrimination, segregation, and inequality. His first book is titled Between North and South: Delaware, Desegregation, and the Myth of American Sectionalism (University of Pennsylvania Press, 2013). The central focus of this project is the three decades long effort to desegregate the state’s system of public education. In the late 1940s and early 1950s, school desegregation proponents won a series of victories in suits against Jim Crow schools that, in part, provided the evidentiary basis for the Supreme Court’s historic decision in Brown v. Board of Education. This campaign continued through the 1970s, as the problem of school segregation emerged most pronouncedly as a function of racially segregated housing patterns. After exposing a record of state-sponsored discrimination in education and housing policy, they secured a ruling demanding the nation’s first inter-district, metropolitan desegregation plan. More broadly, Between North and South explores how historical actors understood the significance of geographic sectionalism and the ways in which they practiced their politics either contributed or undermined sectional frameworks. This work also demonstrated the extent to which activists artfully manipulated—alternately embracing and rejecting—the discursive frameworks like de jure and de facto segregation that so inform historians’ characterizations of American political culture and race relations across time and space. 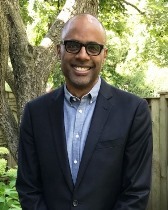 He is currently working on his second book, titled “From Protest to Politics: The Making of a ‘Second Black Cabinet,’” which explores the set of historical circumstances that brought African Americans into close consultative relationships with presidential candidates and later into key cabinet, sub-cabinet, and other important administrative positions in the Kennedy, Johnson, and Nixon administrations and opened to them unprecedented access to centers of power in the federal government. The rise of these figures to prominence, this project contends, marked the beginnings of modern African American executive authority in modern U.S. history. Gadsden teaches courses that focus on 20th-century African American history, political economies of race, racism, and racial formation, black freedom struggles, and social and political history.